Evo & Grace: The WanderLusts: A Full Moon Party in Puerto Princesa City. A Night of Ink and Music. A benefit event for The Book Bridge Project. Celebrate April Full Moon and experience the Full Lunar Eclipse with us on the 4th of April, Saturday! Join our Tattoo Contest and Tattoo Raffle Promos! 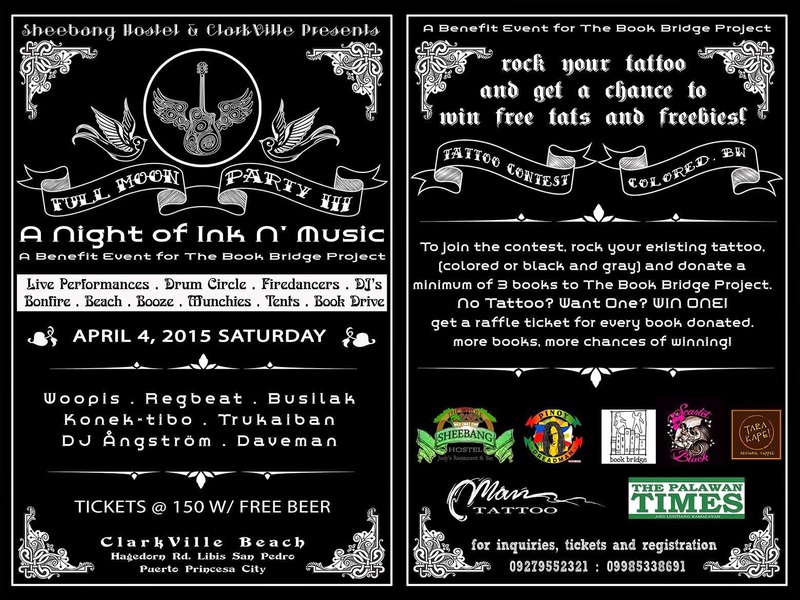 Rock your Ink (colored or black and gray) and get a chance to win FREE tattoos and freebies! To register, Donate a minimum of 3 books to The Book Bridge Project. NO TATTOO? WANT ONE? Win ONE! donate your old books and get a raffle ticket for every book donated. more books donated, more chances of winning! Tickets @ 150 w/ free booze or juice!